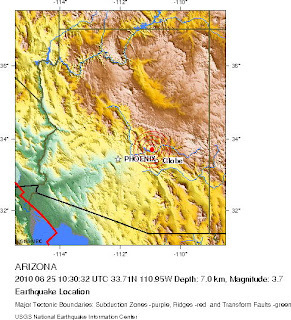 There was a magnitude 3.7 earthquake, near the northeast end of Theodore Roosevelt Lake midway between Globe and Payson or about 50 miles northeast of Mesa. The event occurred last Friday, at 3:30 am local time. I'm looking for more info on whether it was felt, etc. 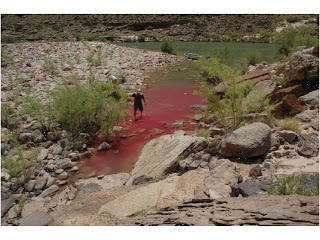 Catching up on the geo-news, I found a recent announcement from Denison Mines that the "United States District Court for the District of Arizona has denied a motion for a preliminary injunction filed by the Center for Biological Diversity, Grand Canyon Trust, Sierra Club, Kaibab Band of Paiute Indians of the Kaibab Indian Reservation, and Havasupai Tribe (the “Plaintiffs”) to halt operations at Denison’s Arizona 1 mine." 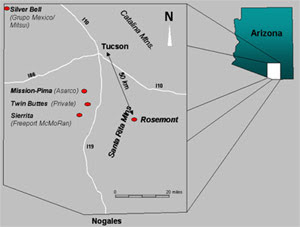 "The Arizona 1 mine is an underground uranium mine located approximately 45 miles south west of Fredonia, Arizona. Ore production began in December 2009. 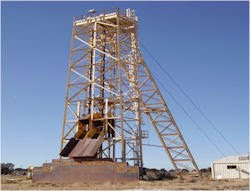 The mine currently is projected to produce approximately 21,100 tons grading 0.49% U3O8 in 2010." 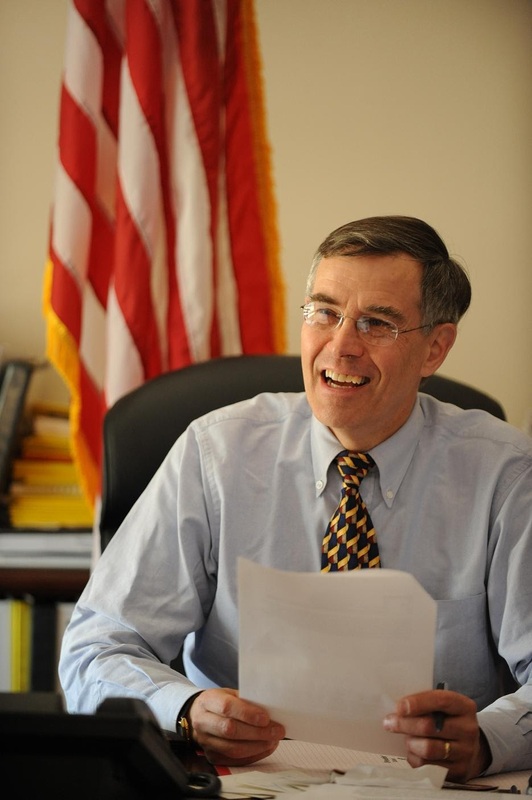 Congressman Rush Holt of New Jersey addressed the opening session of the annual meeting of State Geologists on Sunday, speaking about the origins and impacts of society's aversion to science. Rep. Holt, who has a PhD in physics, argued that following Sputnik, the US took actions that effectively moved science out of our culture to be something that is only done by scientists. He said the of 1958 National Defense Education Act pretty much told 80% of the population that science was not something they could understand. This separation has led to a societal aversion to science, he said. It's also led to quotes such as the one above, that he paraphrased from one of his Congressional colleagues, who did not understand that the Weather Channel relies on government science to present its forecasts. This is emblematic of the disconnect between the role of science in our lives and the perception of the value of science by society. The April 4, 2010, El Mayor-Cucapah M7.2 quake in Baja California resulted in the area around the city of Calexico moving up to 31 inches (80 cms) to the southeast. I presume that this is the relative slip across a right-lateral fault system. 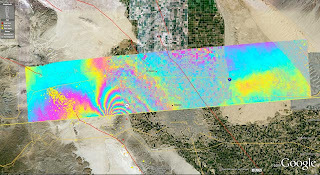 A team from NASA's Jet Propulsion Lab used combined airborne radar images from flights on Oct. 21, 2009, and April 13, 2010 to create interferograms that show the deformation. My blogging resumes today after a 10 day hiatus. We left on a last-minute vacation to our cabin in Wyoming where the internet access was almost non-existent. Back home for a day, then off to New Jersey on Saturday for the State Geologists annual meeting that began in earnest on Sunday. There is a lot to blog about and a lot is happening here at the AASG meeting. 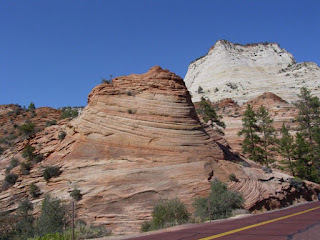 I'll be cross-posting some topics at the new State Geologists blog (stategeologists.blogspot.com). We arrived at the cabin a week ago Saturday, just hours after the Forest Service had tracked and killed the grizzly bear that fatally mauled our cabin neighbor Erwin "Erv" Evert two days earlier. Apparently the USGS had trapped and tagged the bear just a few hours before Erv ran into it on the trail. 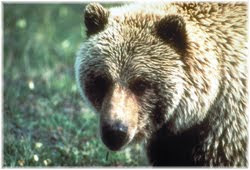 Speculation among the canyon cabin owners is that the bear was disoriented and perhaps agitated following its trapping. We also heard that this bear was not one of the 'problem' bears that are relocated from elsewhere in the Yellowstone region. The Forest Service re-opened the area to the public, including the trail rides that are popular with Yellowstone tourists. So, while life appears to be back to normal on the surface, questions linger about what happened and why. Erwin ("Erv") Evert was killed by a grizzly bear yesterday afternoon near his cabin along Kitty Creek, just east of Yellowstone National Park in Wyoming. We got the word early this morning as ironically we are packing to drive to our own cabin which sits a few hundred yards up the creek from Erv and Yolanda's. The US Forest Service relocates problem bears to our drainage from throughout the Yellowstone region. We understand that two young males were recently brought in that had killed a calf and were hanging around ranches. An email from one of our cabin neighbors said that it took Search and Rescue until 1 am this morning to recover his body from difficult terrain. The Forest Service rangers we know are all at the site (no cell phone coverage) so we are waiting for more news. Erv had just published his book culminating 39 years of collection and identification of plants in the greater Yellowstone area. ...being a Canadian QP for a Tech. or other Reports (a construct of the Canadian Securities Commissions) has nothing to do with AZ or US State Professional Geological Registration (ASBOG) alone. One needs to read the detailed criteria of a QP defined under the terms of Canadian National Instrument 43-101 as to required experience, professional education, good standing in a professional organization, independence etc. 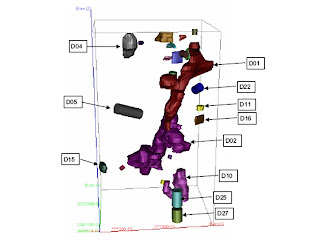 In fact there is a proposed revision in the CNI 43-101 Regulations to take effect in mid 2011 that will not allow one to claim to be a QP based on US state (or multi-state) geological registration alone. You must be a P. Geo., P.Eng. of a Canadian Province, a CPG of AIPG, a Registered Member of SME, CIMM, MMSA or AuIMM etc. The reason for the proposed change is that US State Boards of Technical Registration for Geologists usually decline to discipline PGs for malfeasance especially if the work is done in another state different than the PG is registered with or even in their own state for 43-101 reports. Cited is the lack of listings or examples of state PGs in bad standing, defrocked, fined, sanctioned, etc. This apparently does not apply to State US Professional Engineers. One should read the proposed Canadian Revised NI 43-101 Regulations on one of the 13 websites of the Canadian Securities Commissions (eg: www.bcsc.bc.ca). These revisions are now in the 90 day comment period ending July 23, 2010 - they are said to welcome both positive and negative comments from Yanks, Aussies, Boers and other Fellow Ex-Colonials. 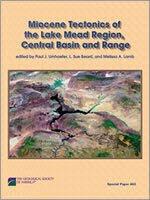 A new Special Paper has been published by Geological Society of America on "Miocene Tectonics of the Lake Mead Region, Central Basin and Range"
L. Sue Beard, and Melissa A. Lamb, SPE463. 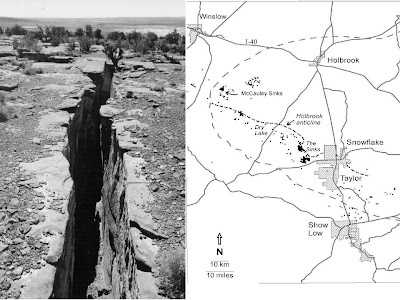 The description notes "low-angle normal faulting was first recognized here, large-scale extension was demonstrated and quantified, and the rolling hinge hypothesis was first proposed." Mary was interviewed for a story on the Daily Finance web site. Okay, I admit it. I love cheesy horror/monster/scifi movies with a geology subtheme. How many of you remember "Monolith Monsters"? The new one I've been following is "Piranha 3D" which is due to be released August 20. It was filmed at Arizona's Lake Havasu (cleverly renamed Lake Victoria in the film). 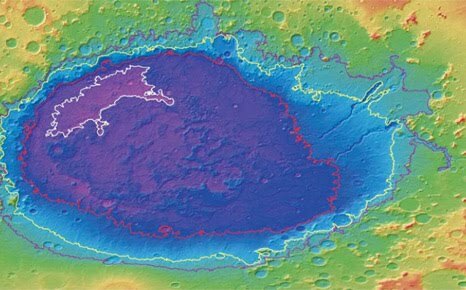 The plot is that an earthquake unleashes hordes of giant prehistoric piranha from their ancient habitat under the lake. During spring break. Amidst hundreds of drunk teens. The trailer for the movie is now out and you can get a glimpse of what these 2 million-year-old critters look and act like. It ain't pretty. M5.7 quake - aftershock to El Mayor - Cucapah? A magnitude 5.7 earthquake about 9:30 pm last night occurred in California near the Mexico border in the midst of a cluster of aftershocks from the Easter El Mayor-Cucapah quake in Baja California. Last nights event was felt across western Arizona including the Phoenix area, but with ground shaking only in the 1-3 MMI range. There have been a number of aftershocks to this event, in the 4 magnitude range. So far, I've seen no reports of damage. UA geosciences professor Rick Bennett has been awarded funding from NSF for the project "Collaborative Research: Geodetic Constraints on the Kinematics of the Colorado Plateau and its Western and Southern Margin," which will allow him to deploy over 30 high-precision continuous GPS units to measure crustal strain in the region. Among an array of projects, Rick's team uses GPS [right] "to detect crustal motions throughout Arizona. Our goal is to determine how the crust is actively deforming. The changes in crustal velocities that we seek to discriminate are very small (< 1 mm/yr) but have important implications for geodynamics and seismic hazards." 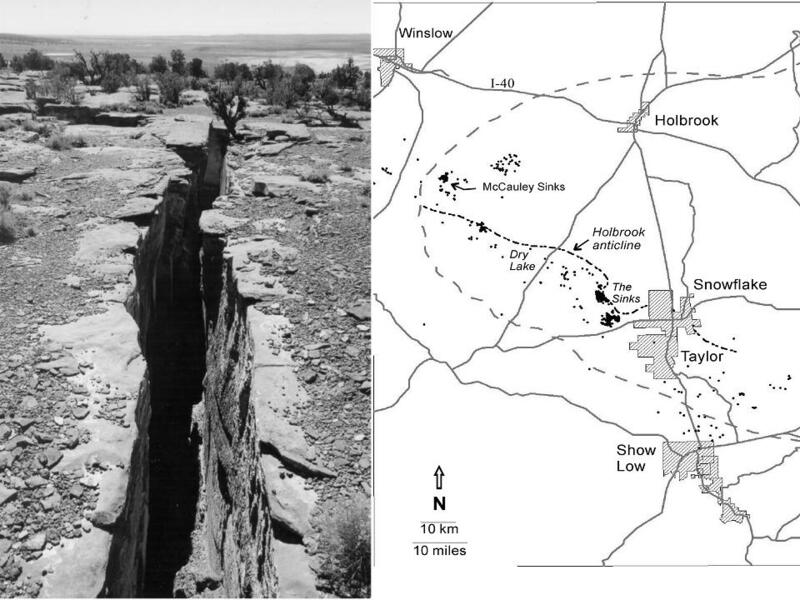 "About 15 miles south of Holbrook, AZ there are extremely deep fissures (referred to locally as "the Cracks") They range from just a few inches wide to several feet wide, but some seem to go down for a hundred feet. When you drop a rock in the crack you can hear it bouncing down the hole for an extremely long distance. Are these formed from seizmic [sic] activity?" Actually, this area is pretty quiet seismically. But it is underlain by extensive salt and other evaporate minerals. As these deposits were dissolved over time, the overlying rocks dropped down, creating a broad anticlinal fold. This resulted in extension cracks over the top of the folded layers which have eroded into The Sinks and other similar features in the region. We have a publication that describes the fractures and related topics with striking photos including the one above. 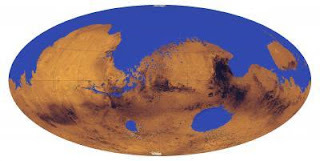 Planetary geologist Rossman Irwin at Tucson-based Planetary Science Institute in Tucson, is quoted as arguing that some of the deltas and valley networks that lie well below the proposed Martian sea level, which contradicts the ocean interpretation. Will the Afghan resources be developed? The news this morning is full of breathless stories over the media's belated discovery of 3-year publicly available reports from the USGS on the mineral resource potential of Afghanistan. The figure of $1 trillion is being tossed around in headlines everywhere. The focus in the stories is on copper and lithium, with many reporters unsure what lithium is and why anyone cares. 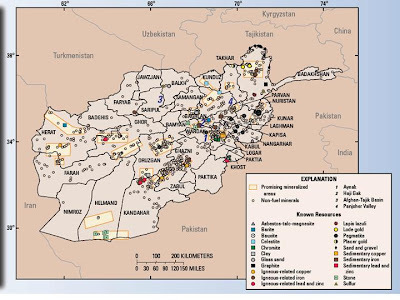 However, they seem to have overlooked a companion study by the USGS on undiscovered petroleum resources of Afghanistan that came out in 2006 [right]. The USGS-Afghan team estimated mean volumes of undiscovered petroleum in northern Afghanistan of "1,596 million barrels of crude oil, 15,687 billion cubic feet of natural gas, and 562 million barrels of natural gas liquids. 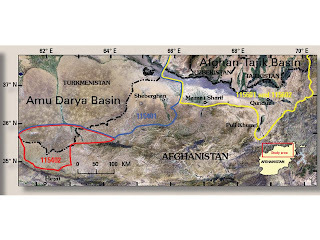 Most of the undiscovered crude oil is in the Afghan-Tajik Basin, and most of the undiscovered natural gas is in the Amu Darya Basin." A colleague of mine in Denver who is well known and respected in the energy industry, a number of years ago showed me a satellite map of a fold and thrust regime in Afghanistan with huge surface anticlines they had interpreted. He and his associates were trying to acquire exploration licenses for petroleum. I had lunch with him in Phoenix recently and asked whatever happened to their plans and learned that they had given up trying to work with the Afghani government. He said the demands were so onerous and unrealistic that no project would be successful no matter how rich the deposit. So, in reading today's headlines, I have to wonder if some of the same factors are the reason we have not seen the mining industry rushing in during the past three years to go over this potential treasure trove of minerals in that country. Of course, political uncertainty and security are perhaps even bigger factors. Grand Canyon Caverns has opened a hotel room in their cave, 220 feet below the surface that can also serve as a bomb shelter. 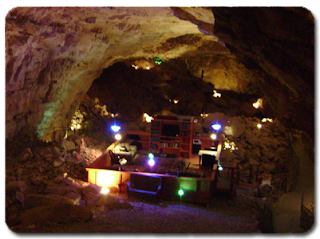 The 28' x 16' 'room' sits on a platform with short walls, in a cavern area 125 feet wide by 300 feet long with a 70-foot ceiling. The caverns are located along Route 66 south of the national park. The press release says the platform is a complete motel room with beds, sofas, dining area, mini kitchen, library, bathroom with shower (ceiling 50 feet above it) TV, phone, and entertainment center. And while it might sound like the ultimate in privacy, the owners warn that tours of the facility begin at 9 am so guests should plan on checking out by then, or expect visitors. Kudos to Mark Evans at the Tucson Citizen for spotting this. 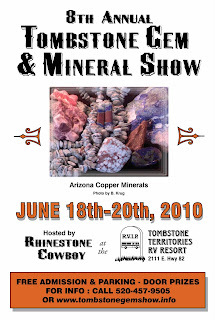 The 8th Annual Tombstone Gem and Mineral Show is being held on Father’s Day weekend, June 18-20. Admission and parking are free. 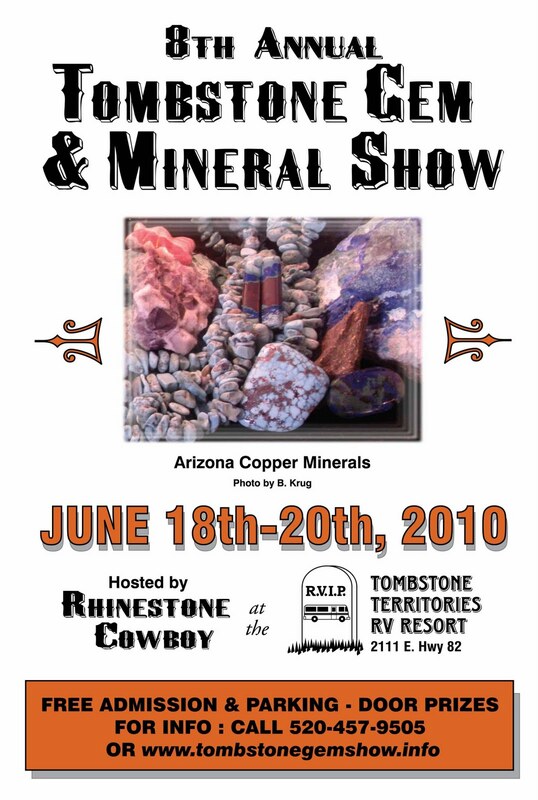 The show theme this year is "Arizona Copper Minerals." Show organizers are also calling attention to the "beautiful, newly discovered Arizona purple opal." Greg Mitchell, chair of the Arizona Section of the the Association of Environmental & Engineering Geologists (AEG) informed me that student membership to this professional organization is now free. The Arizona Section has grown dramatically in the past few years and holds great monthly dinner meetings and talks. "One of the Arizona Section’s biggest annual events is Student Night, where students and professionals get together to network and students have the opportunity to give formal presentations or do poster sessions on their work and research." Unfortunately, the links to the student application on the AEG web site is broken but until they get that fixed, try emailing them at aeg@aegweb.org. 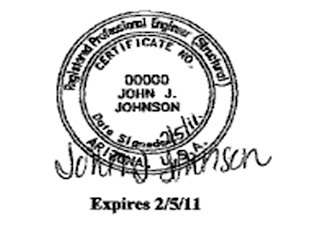 We got a call the other day from a mining geologist, based out of state, who wanted to know what he needed to do to sign off on company reports as a "Qualified Person" in Arizona and whether any of the national professional or Canadian certifications were sufficient. 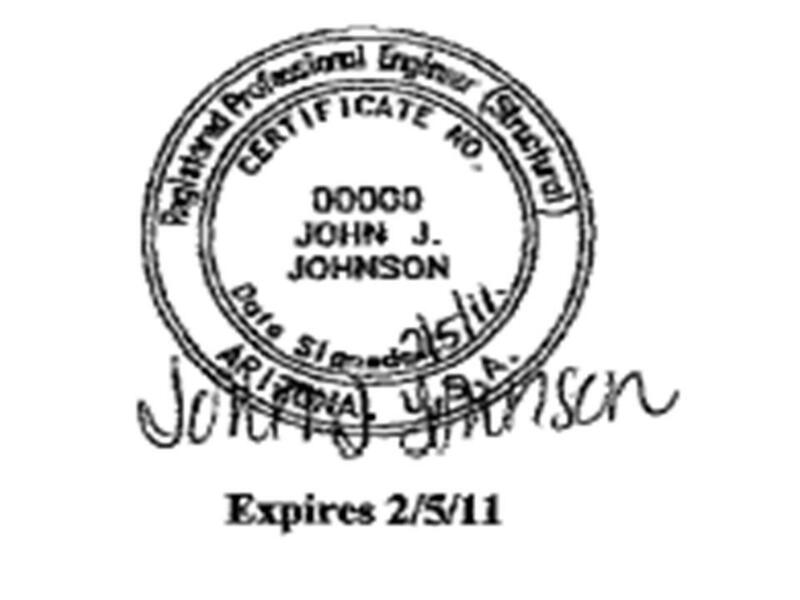 Erick noted that prior to about 1980, the AIPG Certified Professional Geologist designation would have been accepted, but now a geologist acting as a Qualified Person must be registered through AzBTR. Nyal pointed out that there are non-Arizona professionals writing NI 43-101 reports on Arizona mining properties who don't stamp the reports and provided a recent example. Unless someone files a complaint with AzBTR, such omissions may go unchallenged. AzBTR does not have the staff (and has even less ability these days because of budget cuts) to actively seek out violations. They start an investigation only when a complaint is filed. Bottom line - if you are a geologist acting as a Qualified Person on mining projects in Arizona, you should be registered here. If you are an investor considering Arizona properties, make sure the people selling the deal are qualified and registered. 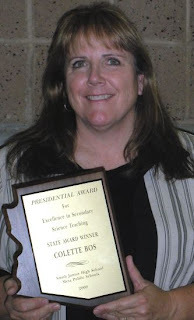 She will receive $10,000 and a trip to DC to receive the award and meet with members of Congress and science agencies. Prior to beginning her teaching career 22 years ago, she worked as "a laboratory investigator for Chevron's mining division and as a field geologist on mining and engineering projects in Western states." Here's more evidence that a geology degree will help take you a long way in life. Why can't scientists fix the oil leak? Why can't scientists and engineers step in and stop the oil from leaking into the Gulf of Mexico? After all, we see resolution of similar challenges take place in minutes or at worst, overnight, on tv and in movies every day. ASU professor Lawrence Krauss raises this point in an opinion piece in the Wall Street Journal today. He notes that "Alas, in the real world it doesn't work that way. The progress of science more often occurs by baby steps than giant leaps. The road from basic knowledge to successful technology is a long and winding one, usually taking decades, not weeks or months." Lawrence writes, "This means recognizing in advance not only that the Gulf disaster was possible but that something like it was inevitable. Only with this mind-set can we be prepared to do the sensible thing: Conduct the necessary research on the physics and geology of deep ocean processes in advance so that engineers will not be flying blind if and when a disaster eventually occurs." He concludes "The economic costs associated with the next Gulf disaster, or New Orleans flood, or nuclear terrorist event will far outweigh the investment that might be made in advance to learn how to minimize the risks and to quickly and appropriately respond to problems." Ref: Behn, K.E., Kennedy, T.A., and Hall, R.O., Jr., 2010, Basal resources in backwaters of the Colorado River below Glen Canyon Dam; effects of discharge regimes and comparison with mainstem depositional environments: U.S. Geological Survey Open-File Report 2010-1075, 25 p.
A Mars mapping project at the Tucson-based Planetary Science Institute concludes that the 2,000 km diameter and 8 km deep Hellas impact basin [right, credit NASA] contains sediments laid down by an ancient sea that filled the body. Dr. Leslie Bleamaster published the 1:1 million scale map using data from an array NASA' Mars spacecraft according to a report on Mars Daily (who knew that there is a daily Mars newspaper?). The lakes are dated at 3.5 to 4.5 billion years old. Pay a visit to Trombley's research center, however, and the story of Arizona's volcano expert turns into a cautionary tale about how the media's push for instant news coverage can sometimes lead to experts with questionable credentials. The International Volcano Research Centre is located in Trombley's home, a pink trailer in Apache Junction. Today, the Phoenix New Times took a swipe at the Republic for a laudatory article they ran on February 6, 2006, entitled, "Volcanologist in AJ is an Eruption Pro," questioning whether the Republic themselves did not do the same kind of credential check they criticize CNN and WSJ for not doing. One item in the Republic's weekend story caught my attention. ASU geology professor Jonathan Fink, who runs the Volcano Listserv, is reported as having told his 2,000 subscribers last year, "To our knowledge, Dr. Trombley does not have training as a volcanologist, and his previous reports have raised concerns among a number of volcano practitioners and organizations . . . about the possibility of misinterpretation." Dr. Fink was interviewed by the Republic as saying that if Trombley were to publish work in peer-reviewed literature, it would "go a long way to quieting his critics." Trombley said his work has been peer-reviewed and told The Republic he was published in Eos, a publication of the American Geophysical Union. No work bearing Trombley's name could be found in a search of AGU's archives. I am a member of the Eos Editorial Advisory Board, so I contacted the Eos editorial staff about this claim. What they found was that Mr. Trombley presented a talk at the 1995 AGU Fall Meeting. The reference Mr. Trombley has on his Web site is to his abstract for the meeting. Eos did not peer review it, but the meeting/session organizers accepted it for presentation at the meeting; therefore, it was published in the abstract collection. Eos is the citation source for abstracts presented at the meeting. Police took control of Grupo Mexico's Cananea copper mine from striking workers on Sunday. 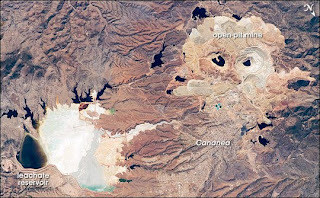 The Mexican mine isabout 40 km south of the Arizona border and has been on strike since July 30, 2007, according to a number of news reports. Up to 2,000 federal and Sonoran state police entered the mine and evicted strikers. President Calderon was reportedly resolved to end the stalemate after the labor union threatened to blow up the mine. The NASA site that provided this photo says a miner's strike in 1906 resulted in 19 deaths and is considered to be one of the major catalysts of the Mexican Revolution of 1910. There's a new blog, Mineral Museum Madness, written by someone identified only as 'Zebra,' that blasts the transfer of the Arizona Mining & Mineral Museum to become the Arizona Centennial Museum. The transfer was signed into law, so it's not clear what the purpose the complaints may serve now, but it looks like the opponents are not giving in yet. So, who you gonna believe? My friend Tom, who follows the mining market pretty closely, forwarded links today to a couple of analysts reports. One noted that in May, commodities dropped the most since 2008 with copper falling 7.5%, with a warning that the 'peak in industrial growth is imminent' which seems to be fueling concerns of a double dip recession. Another argues the market is at one of its most oversold positions in decades and poised for a huge rally. Me? 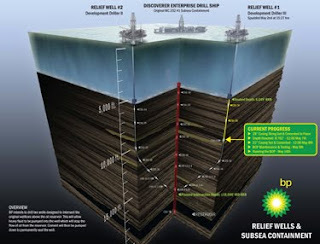 If I had any money left in my retirement account, I'd invest it in oil dispersants. UA planetary scientist Richard Greenberg calculates that the subsurface ocean on Jupiter's moon Europa could have an oxygenated layer more than 300 m thick, with oxygen levels being generated that are high enough now to support 3 million tons of macrofauna, "assuming respiration rates similar to terrestrial marine organisms." The idea of an ancient river system comparable to the Amazon flowing west across the continent is catching the popular media. The story is being widely disseminated. 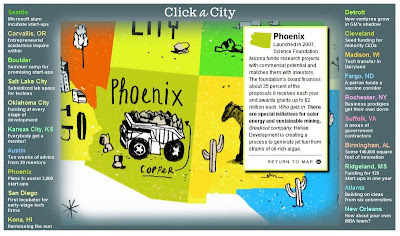 Science Foundation Arizona was highlighted by Inc. magazine as one of the nations best programs to spur innovation in the market place and incubate new industries. Two years ago I participated in a National Academy of Sciences convocation where they also identified SFA as one of the prime examples of how states are stepping up to become leaders in innovation. Inc. noted SFA's support for renewable energy and sustainable mining, among their portfolio. There are scores of science channels on YouTube and a fair number of geology-themed ones. Here's a sampling of geo channels with a fair amount of high quality content. Do you have any others you'd like to recommend? Ryan quotes Don Brandt, president & CEO of Pinnacle West Capital Corp., which owns APS, as saying they are looking at nuclear for those needs but don't want to be in the first wave of applications to build a plant. Rather, they want other companies to clear the political, legal, and regulatory minefields awaiting those applications around the country before APS steps into the fray. Ref: Morris, R. V. et al. 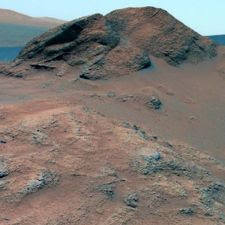 Identification of Carbonate-Rich Outcrops on Mars by the Spirit Rover, Science doi 10.1126/science.1189667 (2010). EPA last month filed a notice of violation (a civil action) against Denison saying the company had not properly notified the agency of its restart of its Arizona #1 mine in northern Arizona [right, Arizona #1 headframe. Credit Denison Mines], and that the state air permit did not satisfy federal requirements. Diana Liverman, a geography professor who co-directs the UA's Institute of the Environment, will receive the Founders Gold Medal from the Royal Geographical Society, at a ceremony in London on June 7, according to an announcement from the university. The Society said Diana is being honored for her contributions in "encouraging, developing and promoting understanding of the human dimensions of climate change." She currently chairs a panel for the U.S. National Academies America’s Climate Choices study and is a former chair of the National Research Council's committee on the Human Dimensions of Global Environmental Change. 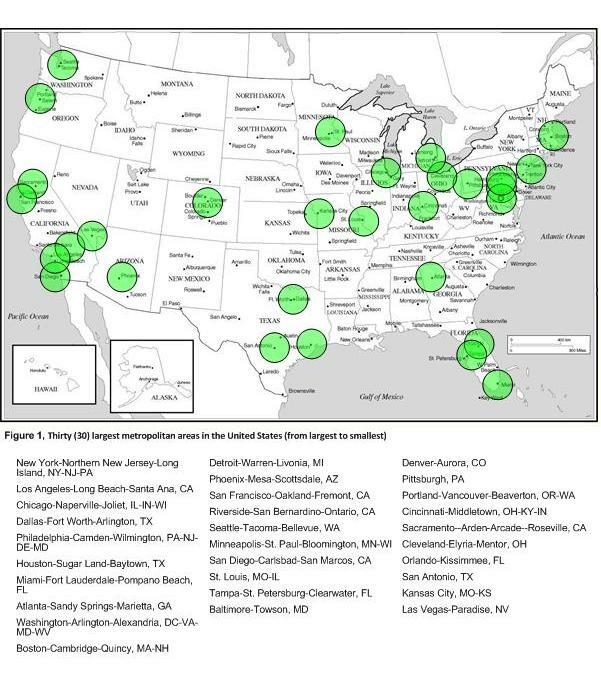 The greater Phoenix metropolitan area is one of 30 across the country that will be analyzed to see how geothermal ground loop systems (heat pumps) can be more widely deployed than the 2% of heating and cooling they now provide. A 3-year DOE-funded project by Bob Lawrence & Assoc. and the California Geothermal Energy Collaborative will cover the largest metro areas of the country with the largest data collection every undertaken to identify the relationship between installation cost and location factors. 1) Manufacturing and installation cost data will be sought from GHP manufacturers and their suppliers, contractors, engineers, installers, drillers, and others. 2) Geological and geographical data--including soil types, thermal conductivity, heat flow, hydrological properties, and heating and cooling demand--will be collected and analyzed for the 30 metropolitan areas. The "conventional wisdom" among many is that geothermal heat pumps are ineffective in Arizona because of dry soils. 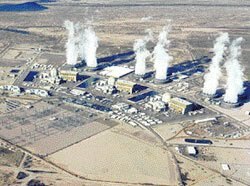 But areas with similar conditions such as Albuquerque have a robust industry. We expect all the data to be incorporated into the National Geothermal Data System that AZGS is helping design, build, and deploy nationwide. Coronado National Forest officials announced that they now expect the Draft Environmental Impact Statement (DEIS) for the Rosemont Copper project will be released and public comment will be invited the fourth quarter of 2010. Public hearings are expected to take place in the first quarter of 2011. The proposed mine is in the Santa Rita Mountains about 20 miles south of Tucson and has attracted strong opposition from some local residents, farming interests, and Pima County politicians, which has led to multiple delays in release of the DEIS. Sonora megashear or Caborca orocline? 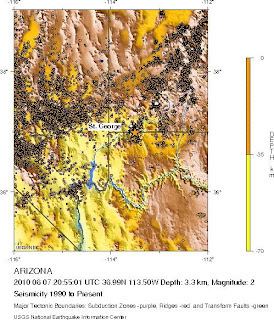 The Mojave-Sonora megashear model was challenged at the monthly dinner meeting of the Arizona Geological Society, by Alex Iriondo, from the Universidad Nacional Autonoma de México. Alex laid out the basis for the Caborca oroclinal bend in southwest Laurentia to replace the model of hundreds of kilometers of left-lateral strike-slip motion of northern México in Jurassic time. Alex argued the megashear model is too simplistic to explain the paleoprotozoic provinces in northwestern Mexico. I have not followed the debate over the megashear in recent years but last night I definitely felt the intensity of being in the midst of a classic geologic debate. Is this an outrageous hypothesis that is not supported by the data or a paradigm shift that is tossing out the old guard? This is one of the things that makes science so exciting.